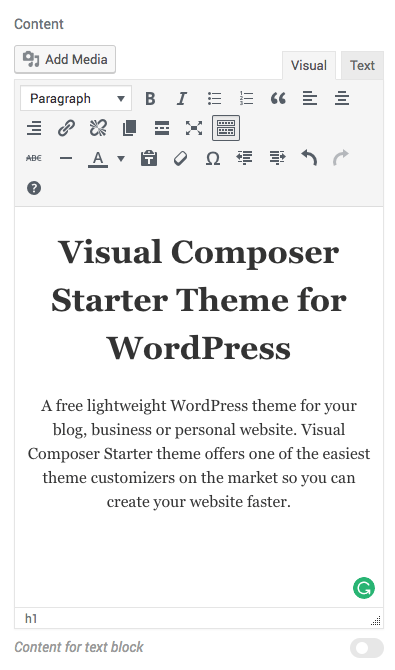 TinyMCE is a classic content editor of WordPress (replaced by Gutenberg in WordPress 5.0). It allows you to write, edit and format text on your website. It is an easy way to manage all your texts with already familiar tools. 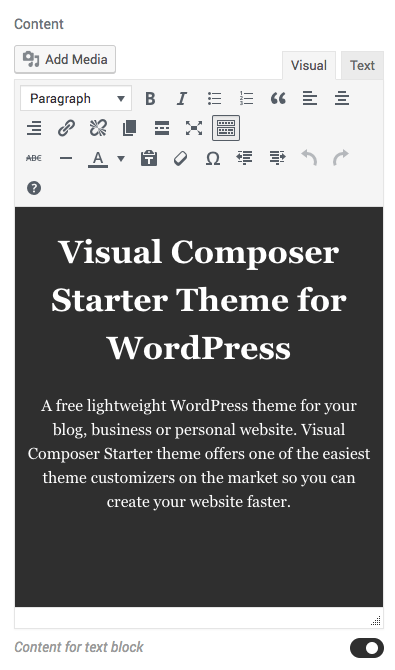 Whenever you add the content elements of Visual Composer that includes text paragraphs, you will have an option to work with the TinyMCE editor. Toolbar Toggle – by selecting this button, the second line of icons will appear, revealing the advanced visual editing buttons. Keyboard Shortcuts – a list of shortcuts you can use to access the toolbar functions quicker. Note: Different WordPress plugins and extensions can enhance TinyMCE editor with additional options, like Skin feature in Visual Composer. You can add images to your text by selecting the Add Media button in the upper right corner. It opens the WordPress Media Library where you can upload your files to the library or select files already uploaded before. In addition, you can easily add an image or file title, caption, alt, and description. By default, TinyMCE offers to edit texts through Visual and Text tabs (available in the upper right corner). The Visual tab allows editing text and instantly see all the formatting applied. The Text tab lets you edit the text in HTML mode which can be useful for advanced users or someone that wants to add customization. For example, you want to add CSS property or custom CSS class to some part of your content within the text block. Visual Composer offers you an option to quickly switch between light and dark skins for the TinyMCE editor. By default, TinyMCE has a light content background which is good for editing dark text. If you have white text, you can use skin toggle (located bottom right corner of TinyMCE) to quickly switch content area to the dark background for better contrast.